Bombing Brain has always been a company of musicians. We met through our love of playing music, and our musical connection stays true to this day. Maybe that’s why we’ve always gravitated towards making products for video and audio professionals. We want to help people who spend their time in the world of multimedia creation. Because we’re creative people ourselves. And thus, we’re excited to introduce today a new service called Backdrop. 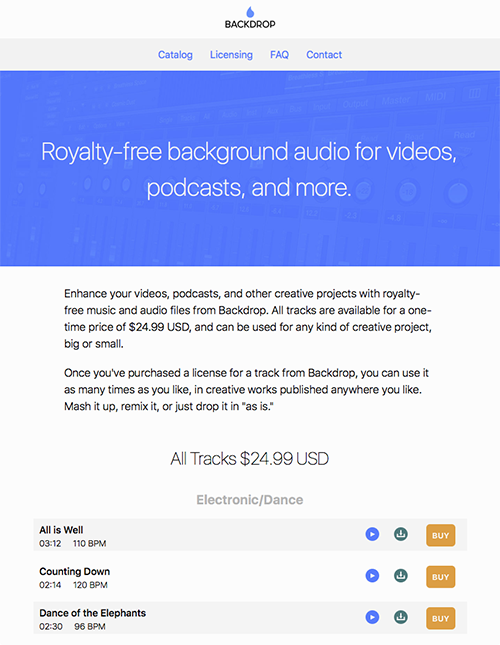 At backdrop.audio, you will find royalty free music and other audio tracks you can drop into your multimedia projects. Videos, podcasts, apps, live performance pieces—wherever you have a need for some background audio, we can help. All of the tracks on Backdrop are composed, recorded, and produced in-house by our own artists. The music is original and exclusive to Backdrop—you won’t find it anywhere else. While there are many sources of royalty free music and sound effects in the world, we thought we could bring something fresh and original to the field. Our licensing terms are far more generous than most other sites, with one low price for the use of a track in any sort of production, to be used in just about any way you see fit, for as long as you like. No yearly renewals, no limitations due to the type or size of the production. For more details on our generous licensing terms, visit our licensing page. Preview 30 seconds of any track for free, and even download a short sample to drop into your project to hear how it fits in. Once you’re ready to buy a license, click the BUY button, fill in some payment details, and a full-length, high-quality file will download automatically. A link will also be sent to you in case you need to download the track again in the future. Our catalog is starting small, because we are crafting these tracks ourselves with care. But new tracks will be added frequently as we grow. We hope to expand our genres over time as well. If you have any requests for a particular style of music or other background audio, feel free to contact us. We will accommodate wherever we can. Our composers are also available to create a bespoke track just for you. If you have a need for original music that is unique, you can request a quote from us. We have composed music for several videos, apps, and podcasts, and we’re happy to work with you. Visit backdrop.audio today and check out our catalog. Setlists 2.1 – Now with backing tracks and metronome! We are happy to announce that Setlists 2.1 has arrived in the App Store – our first major feature update to Setlists 2! With great new features including the ability to play backing tracks with your songs, and a new click feature to keep you on tempo, Setlists 2.1 will be your ultimate live performance companion. Upgrade today, or if you haven’t tried Setlists yet, the app is free to try - download it today! You can now select a track from your iTunes Library or Apple Music to play as a backing track for a song. 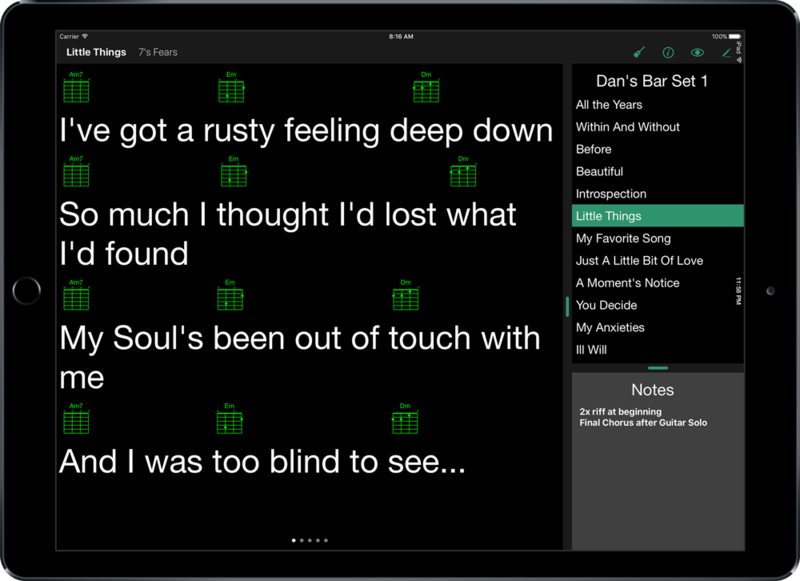 The track can be played while viewing your lyrics in live mode. Perfect for artists who perform along with backing tracks or just for rehearsing. Setlists can also optionally update the song’s title, artist and duration directly from the track. Songs can now have a click associated with them to keep you on tempo. Simply set a tempo by setting the song’s BPM, then turn on the new click feature. While in live mode an indicator will blink giving you the tempo. Songs can be individually configured to have the click be audible or muted. You can also configure the click to be continuous or intro-only (the first few beats for each song). In addition, new global options allow you to choose from 5 different click sounds, configure how the click indicator appears (dot or flash the title bar), and how many beats are allowed for intro-only click tracks. You can now insert a “soft line break” in the editor. This will allow you to add blank lines between lines/phrases which are not interpreted as page breaks in paged mode. If you have an iPad Air 2 or iPad Pro, Setlists can now be run side-by-side with other apps using iOS 9′s new split-view feature. Setlists 2 is free to download for everyone. Explore around the app and try the features that make Setlists the best choice for live performers. Most of the app’s functionality will be available to try free on a limited basis. 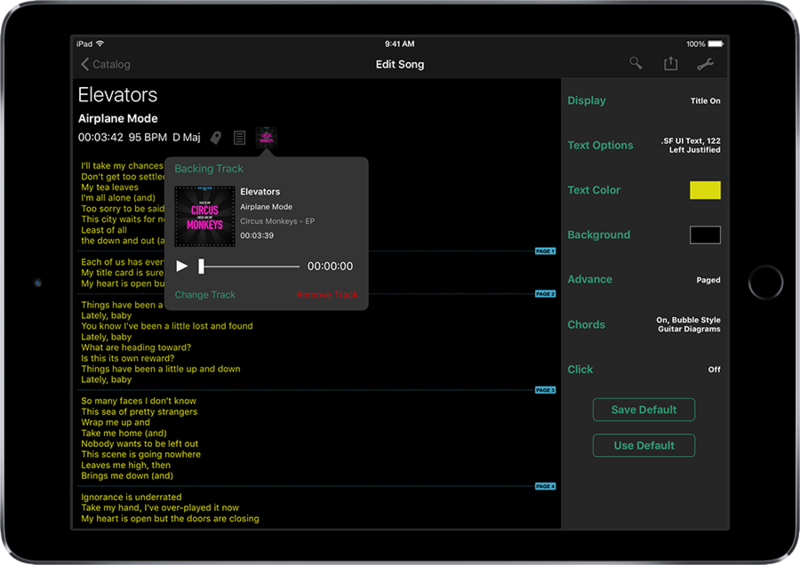 When you are ready to add Setlists to your performing workflow, one simple in-app purchase will unlock all of the app’s unlimited potential. 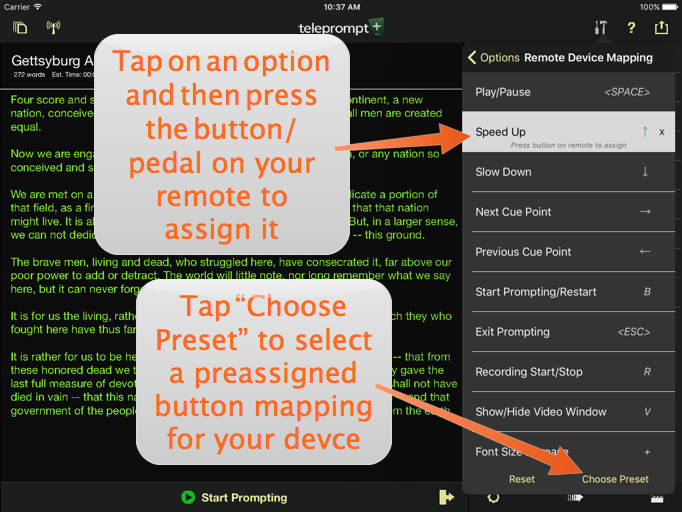 More Remote Options with Teleprompt+ for iOS (iPad/iPhone)! We are very happy to announce new partnerships with Teleprompt+ for iOS. We have added support for the ikan Elite Prompter, iRig Blueboard, iRig BlueTurn and the Grip&Shoot remotes. Many thanks to the folks at ikan, IK Multimedia and Grip&Shoot for reaching out to us to help make this happen. One of the great things that came out of adding support for all these great remotes is we added an easy way to customize what each button on your remote of choice does. We’ve added presets for the most common remote setups but if you think a certain button should perform a different action then you can set it up however you want. The other benefit of this is that it should work with any bluetooth or midi enabled remote that can pair with your iPad or iPhone even if we don’t explicitly list it in our list of remotes (but let us know if you are using one of the unlisted remotes). So how do you set these devices up? We hope it’s easy and intuitive but here is a guide to make this even easier. This is a great starting point if you are using any of the following devices: All AirTurn foot pedals and remotes, Grip&Shoot, ikan Elite, iRig BlueTurn, PageFlip Cicada/Firefly, Satechi Multimedia and Smart Pointer remotes. If you have any other bluetooth remotes that are not listed here you can also follow these instructions and use the manual button mapping to set up your remote. 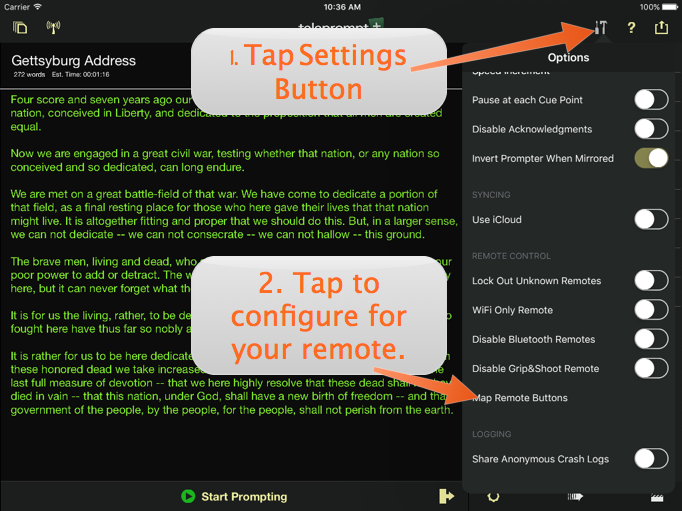 Refer to the instruction manual that came with your remote in order first pair the remote with your iPad or iPhone. This is normally done in the Settings app under the “Bluetooth” option. Once you have your remote paired with your device then start Teleprompt+. In edit mode of the app tap on the Settings button (has an icon of a screwdriver and hammer) in the upper right corner on the iPad or at the bottom right corner of the “Groups” screen on the iPhone. Scroll to the bottom of list of options and tap on “Map Remote Buttons” (If using the Grip&Shoot please see additional instructions below or the iRig Bluebooard then see these instructions). In the Presets screen find your device and the configuration you want (single pedal, two pedal – speed, etc) and tap on that. 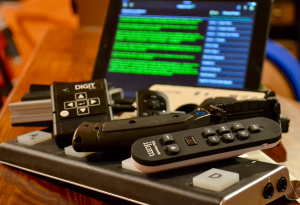 Now your device is configured to work with Teleprompt+. Just start prompting and give the remote a try. Make sure your remote is paired with your device (see the instructions that came with your remote for help pairing the remote). In the mapping list find the function you want to control with your remote (Play/Pause, Speed Up, Next Cue Point, etc) and tap on that option and it will highlight. Then press the button/pedal on your remote and now that function is mapped to that button. If you get a message saying that button is already assigned then take note of which function it is mapped to and remove that mapping then try again. Repeat steps 4 & 5 for all the buttons you want to map on your remote. Each of these mappings will be stored in the app and does not need to be done again. In edit mode of the app tap on the Settings button in the upper right corner (has an icon of a screwdriver and hammer). Tap on the option you that you want to remove the mapping. Tap “Yes” on the delete confirmation and that button mapping will be removed. The Grip&Shoot remote has a couple extra steps to first set it up and luckily this only needs to be done once. Tap on the settings button (has an icon of a screwdriver and hammer) which is in the top right hand corner of the edit screen on the iPad or in the bottom right corner of the “Groups” screen on the iPhone. Scroll toward the bottom and turn off the settings labeled “Disable Grip&Shoot Remote”. Turning this off will tell the app to always scan for a Grip&Shoot remote when it is running. Then just tap one of the buttons on the Grip&Shoot and it will pair with the device (and app). Then follow the instructions above to complete the button mapping. If you want to use the iRig Blueboard the setup can be tricky at first. So for those of you who are looking for instructions on setting up the BlueBoard, check out the guide below. Install the BlueBoard app on your device. Make sure that Bluetooth is enabled on your iPad/iPhone. Turn on the BlueBoard by flipping the switch on the bottom of the pedal to the on position. Then launch the BlueBoard app and it will immediately start looking for the foot pedal. Once it finds your device it will display that in a list in the middle of the screen. Just tap on the name to connect the devices. The devices are now paired and you can exit the BlueBoard app. We are very pleased to have support for all these different remotes and devices. We hope you find the device that is right for you and helps you or your talent perform better. If you have any device that is currently not on the list please let us know and we’ll see what we can do. Happy prompting! One of the little known new features of Setlists 2 is the support for the Bluetooth MIDI pedalboard made by IK Multimedia, the iRig BlueBoard. We’ve had many customers request support for this when it was released. At that time we were right in the middle of the major rewrite of Setlists. Although it was another task in an ever-growing list of things to do with the new app, we knew we had to add it. So we carved out some time to get that integrated. 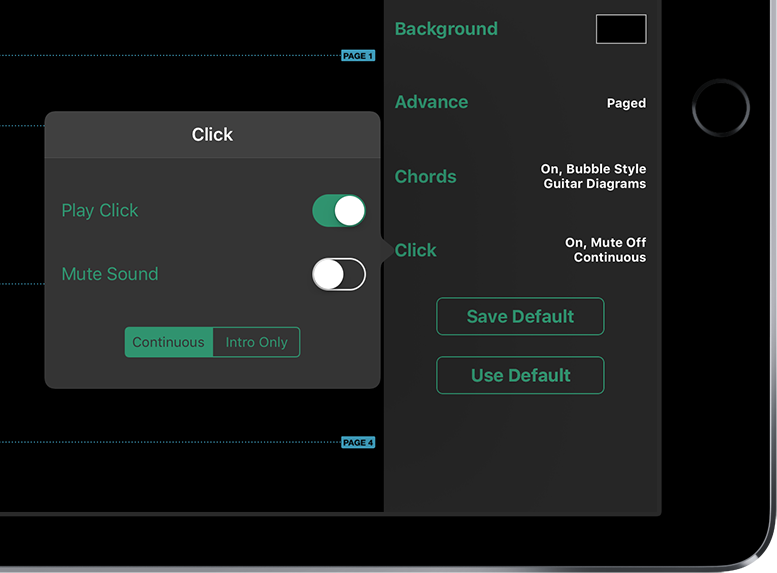 In doing this we quickly realized we had to add some sort of key/button mapping tool so that the app would work with the BlueBoard and could continue to work with the existing pedals and remotes such as the AirTurn, PageFlip and Satechi devices. Along with adding support for the BlueBoard, this also opened the door to allow support for almost any kind of remote device. A win/win! The downside to this is that it does add a bit of complexity to the app and the BlueBoard setup can be tricky at first. So for those of you who are looking for instructions on setting up the BlueBoard, check out the guide below. Setting up the iRig BlueBoard with Setlists. By default Setlists is mapped to support the most common bluetooth foot pedal setup which uses the arrow keys and page up / page down commands. Since the iRig is a MIDI device, it behaves a bit differently with the app and each of the buttons must be configured to work correctly. The process is very simple, and after it is done it will not need to be configured again. Once the BlueBoard and your iPad/iPhone are paired you can launch Setlists. In order to configure which button on the foot pedal controls the app, tap on the Tools button in upper right corner of screen (icon looks like a wrench). In the Tools menu, scroll down and find and tap the “Map Remote Buttons” option. This menu contains all the various controls you can assign to the foot pedal. Tap on the one you want to configure. Once the setting you want to configure is highlighted, simply press the button on the BlueBoard that you want to use to perform that action. Repeat sets 4 & 5 for each of the buttons you want to assign and then tap anywhere outside the menu to close it. 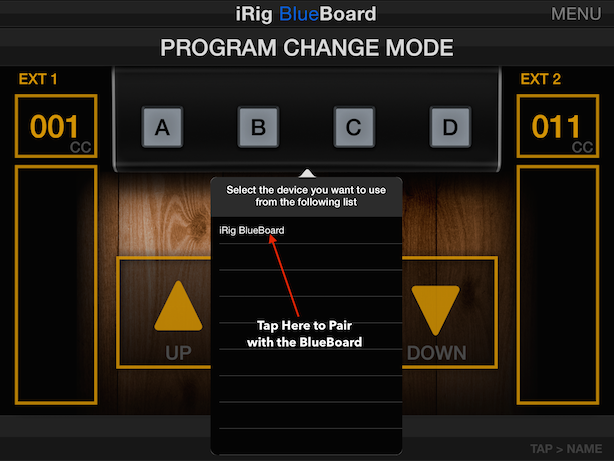 Now choose a setlist and song to prompt and your iRig BlueBoard will now control your iPad using your assigned settings. If you need to change or reset all of these mappings just tap the “Reset Device Mappings” button at the bottom of the mapping screen. Note: If you turn off your BlueBoard and then turn it back on you will have to first go back into the BlueBoard app and re-pair the devices. If the Blueboard app was already running on your iPad (in the background) you will also have to tap on the “Tap here to connect your BlueBoard” text. After doing this it will search and list your foot pedal. Once again just tap on that to reconnect then launch Setlists and your good to go! Configuring the BlueBoard is a very simple process but pairing it with your iPad is a bit different than normal since you have to use the BlueBoard application. Once you get used to that process the rest should go smoothly. The iRig Blueboard is an awesome foot pedal and we hope to add more features to the app to get even more use out of the pedal. It’s a great addition to any performing artist who needs hands-free use of Setlists. Apple has released iPad Pro, an all-new device with a stunning 12.9-inch screen. Users of both Teleprompt+ and Setlists will be happy to learn that we are hard at work optimizing both of these apps to take advantage of all this new device has to offer. When it comes to prompting text, bigger is better. This new iPad promises to offer the best Teleprompt+ and Setlists experience yet. If I buy an iPad Pro today, can I use it with Teleprompt+ or Setlists? Yes! While taking advantage of the native resolution of the new iPad Pro will take some work on our part, in the meantime, the app works perfectly well in “scaled” mode. That is, the interface will simply scale up to the new resolution. So you can use your Bombing Brain apps just as you always would. When the fully optimized versions arrive before the end of the year, the experience will get even better. Is there any benefit to using Teleprompt+ or Setlists on iPad Pro before these updates arrive? Yes! iPad Pro is a really fast and powerful iPad. And the larger screen means text is that much easier to read. Perfect for prompting apps like ours. Will I need to purchase an upgrade when the new optimized version arrives? No. Even though this optimization will take a considerable amount of effort, we will be offering it as a free update on the App Store to our existing customers. Will this new update effect performance on other iPads and iPhones if I decide not to purchase an iPad Pro? No. While we are focusing on iPad Pro specifically for this update, we continue to fix bugs and address concerns for our customers using all other iOS devices. iPad Pro-specific optimizations will not impact you negatively if you use other devices. What about that bug I reported? Are you dropping everything to work on nothing but this new device that few of us own? We are working as hard as we can on all reported issues, not just this iPad Pro optimization. Rest assured, we will continue to work to make the best apps we can for all of our customers. When will this update arrive? While we can’t make any promises, we do hope to have this update ready to submit to Apple before the end of the year. The update will be subject to Apple’s approval process, as always.